279 pages | 218 B/W Illus. Natural fibre composites are increasingly being viewed as viable and environmentally responsible alternatives to synthetic fibre composites and plastics. Sugar Palm Biofibers, Biopolymers, and Biocomposites considers the use of sugar palm fibres for materials development and application. It offers original research on the properties and behavior of sugar palm’s fibres, polymers, and biocomposites, covering mechanical, physical, thermal, chemical, environmental, morphological properties, as well as optimal design. It discusses sugar palm fibre thermosetting composites, sugar palm fibre thermoplastic composites, impregnation of sugar palm fibre, various lengths of sugar palm fibres, forms and arrangements such as particulate, continuous roving, and woven fabrics. 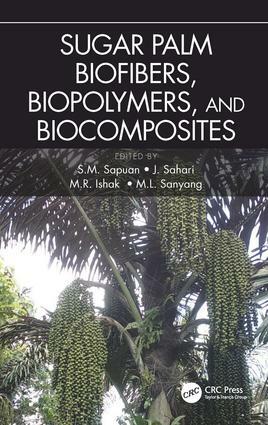 The book also discusses innovations in commercialized products derived from sugar palm. S.M. Sapuan is head of Laboratory of Biocomposite Technology, Universiti Putra Malaysia. He earned his B.Eng degree in Mechanical Engineering from University of Newcastle, Australia in 1990, MSc from Loughborough University, UK in 1994 and Ph.D from De Montfort University, UK in 1998. His research interests include natural fibre composites, materials selection and concurrent engineering. To date he has published more than 450 journal and 450 conference papers, 12 books, 5 edited books and 50 chapters in book. He has received numerous awards and honours, among others, ISESCO Science Prize in Technology, 2008, Plastic and Rubber Institute, Malaysia Fellowship Award, Kuala Lumpur Rotary Research Gold Medal Award, Alumni Award, University of Newcastle, NSW, Australia, Khwarizmi International Award (KIA), a Leadership Award from Society of Automotive Engineers International (SAE) i.e. SAE Fellow Grade of membership and 2015/2016 grantee of SEARCA Regional Professorial Chair. M.R. Ishak is a senior lecturer in the Department of Aerospace Engineering, Universiti Putra Malaysia since 2013. He earned his Bachelor’s degree in Manufacturing Engineering from Universiti Teknikal Malaysia Melaka in 2007, and Master of Science in Materials and Design Engineering in 2009 and PhD in Materials Engineering in 2012 from Universiti Putra Malaysia. His research interests include natural fiber, biopolymer and biocomposite materials, plastic technology, polymer composite design and testing, composite modifications and properties enhancements, vacuum resin impregnation and manufacturing process. Dr. Ishak registered as a Graduate Engineer with Board of Engineers Malaysia, Graduate Member of Institute Engineers of Malaysia, Member of Malaysian Society of Structural Health Monitoring and Member of Plastics and Rubber Institute of Malaysia. To date, he has 22 journal and 23 conference papers to his credit. He is currently heading a research project titled "Preparation and Properties of Kenaf Santoprene Filled Composites" worth RM 47,000. Dr.Ishak has won the Best Student Poster Presenter in International Conference on Innovation in Polymer Science and Technology (IPST 2011) International 2011 and has won a silver medal in Exhibition of Invention, Research and Innovation (PRPI 2010) Universiti Putra Malaysia. M.L. Sanyang is currently an Environmental Specialist at the Gambia National Petroleum Corporation (GNPC, Gambia) as well as a part-time lecturer in the Agriculture and Environmental Science School at the University of The Gambia (UTG). He recently completed his post-doctoral fellowship under the Laboratory of Biocomposite Technology at Universiti Putra Malaysia. He earned his Bachelor’s degree (BSc) in Material and Mineral Resources Engineering (Petroleum Engineering program) at National Taipei University of Technology (Taiwan), Master’s degree (MSc) in Environmental Engineering and PhD in Green Engineering at Universiti Putra Malaysia (UPM). Dr. Sanyang received the "Best PhD student award" for his outstanding researches, publications and PhD completion on time. His main research interests are: (1) Green Engineering (developing environmentally friendly materials and technology), (2) Environmental Engineering (water and wastewater treatment; utilization of agricultural wastes), and (3) Environmental Management. Dr. Sanyang has published more than 15 journal articles in international journals, authored or co-authored more than 8 book chapters and 2 edited books. He also served as reviewer for many international journals such as Polymer Composite, BioResources, Polymers (MPDI), Polymer Bulletin, International Journal of Polymer Science, and Current Analytical Chemistry. J. Sahari was a senior lecturer at the Department of Industrial Chemistry, Faculty of Science and Natural Resources, University Malaysia Sabah, Kota Kinabalu, Sabah, Malaysia since 2014. He was appointed Honorary Research Assistant in University of Liverpool, UK in 2012. He earned his Bachelor of Science degree in Industrial Chemistry from Universiti Putra Malaysia, Master of Science in Advanced Material Engineering from Universiti Putra Malaysia in 2011 and PhD also in Advanced Material Engineering from Universiti Putra Malaysia in 2013. Sahari won the Best Scientific paper and oral presentation of UPM-UniKL MICET Symposium on Polymeric Materials and the Third Postgraduate Seminar on Natural Fibre Reinforced Polymer Composites 2012.